Visual Studio Code>Other>Xi markup languageNew to Visual Studio Code? Get it now. This extension is published to the "Extension Marketplace". To install it, click on the "Extensions" icon in the Activity Bar on the side of VSCode and enter "Xi markup language" in the search field. Click on the "install" button near the extension listed in the search results. Extension provides a single command extension.xi.lookup that is binded to the ctrl+k x by default. This command brings file search for the directory with xi files, which is ~/.xi by default and can be changed via the xi.lookupPath configuration option. It assumes workflow where if you are in any VSCode project and want to consult your personal knowledge base or add something to it, you hit "ctrl+k x", enter part of file name and open corresponding file for read and update. For example, writing some Python source code you want to remind yourself about API nuances. You know, that you store programming languages API records in files named "language_api.xi", so you hit "ctrl+k x", enter "python_a" that narrows search to "python_api.xi", hit enter, open file, check your notes and return to your code. Simplest building block of a knowledge base, first paragraph line is prefixed with dot-and-space, while each next line is prefixed with two spaces. Paragraph itself can be indented with increments of two spaces in order to nest under different heading or other paragraphs. 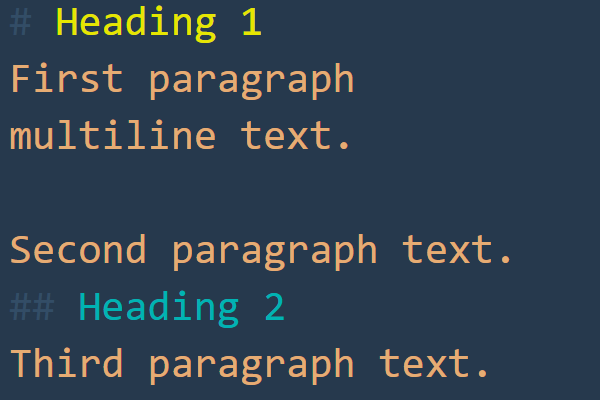 Compared to markdown notion of separating paragraphs with empty line, such layout saves a lot of vertical space, which is vital for documenting software-related things like programming lanugae syntax, APIs, frameworks etc. We tend to have short paragraphs that do not tend to follow each other, but tend to form a really complex nested strucure with lots of headings, meta information, code samples etc. Such paragrapah layout, used alongside colored headings and proper indentation, proved it's worth during my 10 years of using Xi as a personal knowledge base. Alongside paragraph, heading is a second most used building block for a knowledge base. 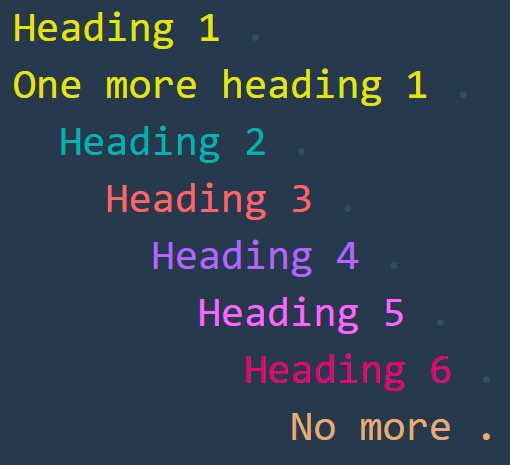 Heading type is denoted by space-dot suffix, while heading nesting level is denoted by increments of two spaces. In most cases headings are combined with paragraphs in order to create hierarchical structures that are easy to read and modify. Here Xi starts to differenciate from Markdown. Simple "wikiword" link looks like one in Markdown, [foo], but clicking on such link will try to open corresponding file, so everything works locally within VSCode. File name is created by lowercasing text between square braces, replacing spaces with underscores and appending .xi suffix. So clicking on the [foo] wikiword will instruct VSCode to open foo.xi in same folder, or ask to create one if it does not exist. Wikiword links with anchors extend this concept by allowing to add heading name after #. Clicking on the like like [js api#search] will try to open js_api.xi file and scroll to the first search hading (that starts with spaces and ends with space-dot). Nested anchors are supported by chaining multiple '#' like [js api#* String#- search]. Header links transforms a header into link by adding  . instead of space-and-dot. Mostly useful while describing APIs or frameworks with complex tree structures where some headers points to articles of their own. Header can also start and/or end with wikiword links. Anchor links starts with # and jumps within same document (mostly used for "Reference" section at bottom). Anchor target is specified by placing # as a last symbol of a wikiword link, so clicking on the link [#1] will jump into a line with [1#] anchor. Usage example that describes an "insert" method that takes two named and positional parameters, "indice" and "item". 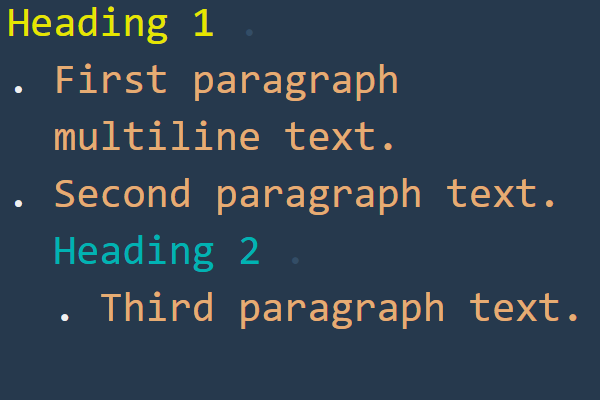 Like in Markdown, lists in Xi are denoted with #, * or - characters. 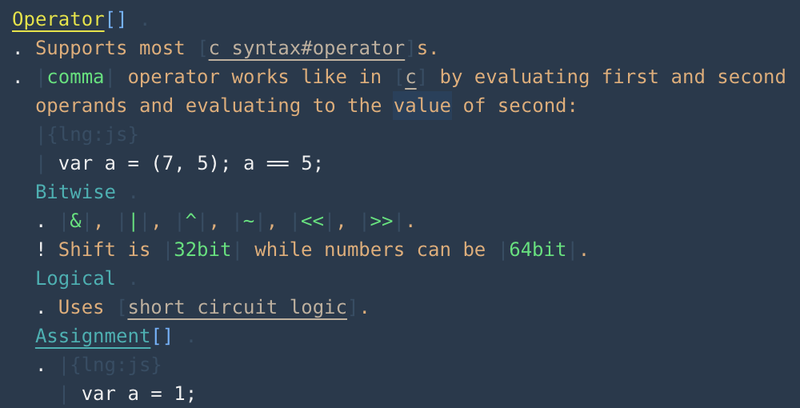 The syntax highlighting behaviour is the same as with paragraphs (that start with the . character).